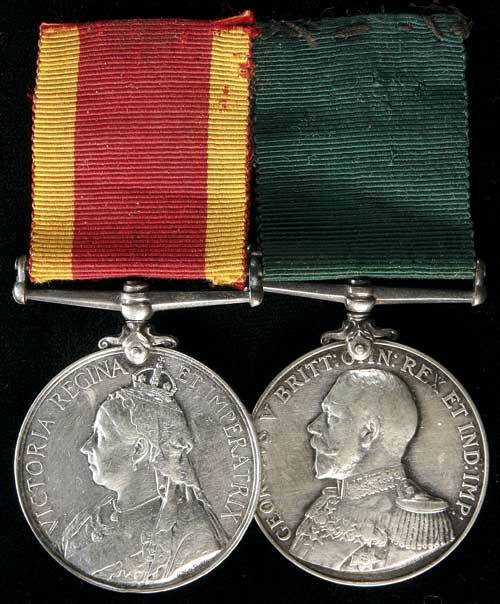 PAIR: China War Medal 1900; Royal Naval Volunteer Reserve Long Service and Good Conduct Medal (GVR). L.Davis. A.B., N.S.Wales Nav. Contgt on first medal, A.B. L.Davis on second medal. The first medal renamed with the name engraved, the rank and unit impressed, the second medal impressed. Fine. Louis Napoleon Davis, carpenter, born 15Aug1872 at Sydney, NSW; Emb.08Aug1900 as member of B Coy NSW Naval Contingent on SS Salamis; RTA 06Sep1900 sick via SS Airlie (SS Salamis did not arrive at Taku in China until 3 days later on 09Sep so Davis must have returned from a port en route such as Brisbane, The Philippines or Hong Kong); to RAN Brigade on full time duty at Newcastle, NSW 04Nov1907; Enl.01Oct1911 from RAN Brigade Staff as general workman and caretaker, Dept of the Navy Garden Island; sick 17-25Jan1914 due to tram accident; Re-Enl.01Oct1914; Re-Enl.01Oct1917 as Petty Officer Carpenter; 15May1919 allegations made against Lieutenant White (records indicate sailor had developed hysterical tendency and silent antagonism towards officer); Disch.15Jul1919. Research notes that Long Service Medal not recorded on available documents however his service suggests that such an entitlement could be expected. Not on the China Medal Roll for the NSW Contingent. It is probable that Davis acquired the China Medal and had his name engraved thereon believing that his service qualified for the medal. It is also interesting that Davis attended the first China War NSW Contingent reunion in Sydney in 1903. His service records note that his service suffered from 'periodical mental derangement'. Louis Napoleon Davis died at Belmore in 1935 at age 63. He was buried at the Presbyterian Cemetery, Rookwood. Bretheren of Masonic Lodge Belmore No.244 of the UGL of NSW and officers and members of the M.U.I.O.O.F. Loyal Belmore Lodge 569 were invited to attend.